Calochortus flexuosus is a species of lily known by the common names winding Mariposa lily and straggling Mariposa lily. This is a bulbous perennial wildflower native to the Southwestern United States, the Mojave Desert in California, and northern Mexico. It is most often found in desert scrub, growing up through low shrubs. Calochortus flexuosus is mainly one long naked stem with only one or two small leaves toward the base. The stem may branch and is usually winding and bent or curving. At the end of the stem is a showy flower in shades of pink or lavender to white, with solid yellow and stripes or spots of white and red at the base of each petal. 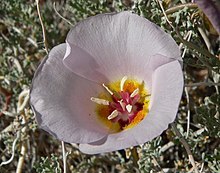 Calochortus flexuosus was published as a new species by Sereno Watson in 1873, based on material collected by Ellen Powell Thompson in 1872 in the vicinity of Kanab, Utah, during the US Topographical and Geological Survey of the Colorado River (led by John Wesley Powell). Her specimen, the holotype, resides in the United States National Herbarium (US). Wikimedia Commons has media related to Calochortus flexuosus.